OBJ files and OBJ File Sequences are supported by Plexus. Starting v3.0, OBJ Files are imported as Footage Items using After Effects’ native file importer. Watch the OBJ Import Tutorial to see how it works. Although not officially supported, Trapcode Form imported OBJ File Footage is also known to work. Only Vertex Positions,Normals, UVs and Faces are imported. No other attributes like groups, curves etc are imported. Cinema 4D is officially supported and we recommend using the OBJ Sequence Exporter for Cinema 4D as it was designed specifically for Plexus. OBJs from other applications also work, but they have to be normalized and scaled manually to the composition size in Plexus. 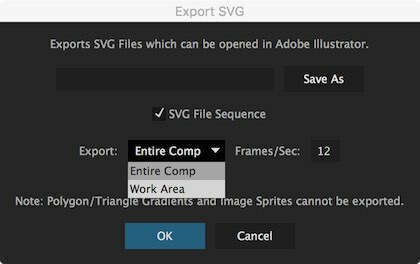 You can export SVG vector files from Plexus. SVG files can be opened in Adobe Illustrator and also in many modern web browsers. You can export the current active frame in the composition or the current Work area of the composition or the Entire Composition as an SVG File Sequence. There are a few limitations to keep in mind. Triangle gradients aren’t supported, but line gradients are supported. SVG files are vector files, which can be used at any resolution and are very useful in print projects. Please Note: SVG Export is disabled in trial mode. You need to register Plexus with a valid license to enable this feature. © 2010-2019 Rowbyte, Inc. Sitemap.